I have just been admitted to a graduate program at the University of Michigan. Can I apply for admission to the Museum Studies Program? According to Rackham rules, students must complete at least one term of coursework in their primary degree program before they are eligible to apply to a certificate program. I am a current U-M student. How do I apply to MSP? Students already pursuing a graduate degree at U-M in a non-Rackham program must create an online account in ApplyWeb before completing the Rackham Graduate Program Application. I am a current U-M student taking courses in my home program, and not yet admitted to MSP. Can courses I take before joining MSP qualify as MSP electives? Or by reconsidering the course materials from a museum studies perspective through writing a brief reflective paper that integrates your prior work with relevant issues in Museum Studies. Please meet with the MSP director to determine whether your prior coursework will qualify as an elective, and what steps you need to take to get it approved. I am not a current U-M student, but I am interested in pursuing the MSP certificate as a free-standing degree. Am I eligible to apply? 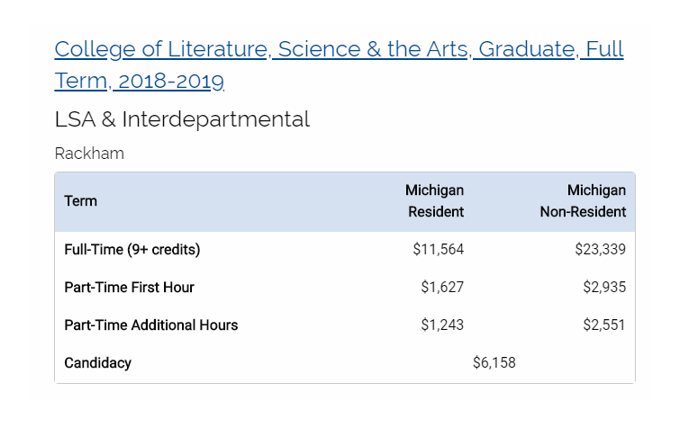 You are eligible to apply to MSP as an independent program if you have completed a graduate degree (at U-M or elsewhere) within the last five years. You are not eligible to apply if your highest degree is a BA or BS. I am not a current U-M student. How do I apply to MSP? Can I enroll in MSP as a part-time student (for example taking only one course per semester)? Or must I be a full-time student to pursue the certificate? Most students who are pursuing the MSP Certificate as a free-standing degree have the option of enrolling as part-time students and taking only one or two courses in a semester. However, international students must be enrolled full-time due to federal regulations. And all students, whether full or part-time, must complete the certificate within four years of joining the program, and must complete MSP 601 and 602 in a single year (fall and winter terms respectively). What is the cost of pursuing the certificate as a free-standing degree? take 3 credit hours over four semesters and enroll as a part-time student. In all scenarios, MSP601 and MSP602 must be taken sequentially in a single academic year. You do not have to pay tuition for the required practicum. Please note: federal regulations require that foreign students must be enrolled full-time. Does not include any required fees. Tuition changes from year to year. Please visit the Registrar’s Office Tuition and Registration Fees page for latest information on current tuition rates. (See “College of Literature, Science & the Arts,” Rackham and Interdepartmental.) Note, this information does not apply to international students, who must enroll as full-time students for two semesters to complete the program.